"Accelerating Enterprise Mobility Security Adoption"
IoT is here, fueling the fire for cyber risk via mobile sources. By 2020, there will be more than 1,000,000,000 M2M (yes, a billion plus!) connections, each device module capable of accessing your network by a malicious hacker. Are you or will you be prepared? Despite growing security risks, budget constraints and a perceived lack of internal concern have led to a slow adoption of formal mobile security policies and technology solutions. Most enterprises are inexperienced in mobile applications security and the developers don’t completely focus on the security but their functions, thus making them vulnerable to security threats. Technology is evolving rapidly and keeping that in mind, the executives must have clear-cut answers to all the possible mobility use-scenarios with a robust security solution in place to ensure business information is kept secure and is only accessible to those who need to access it. 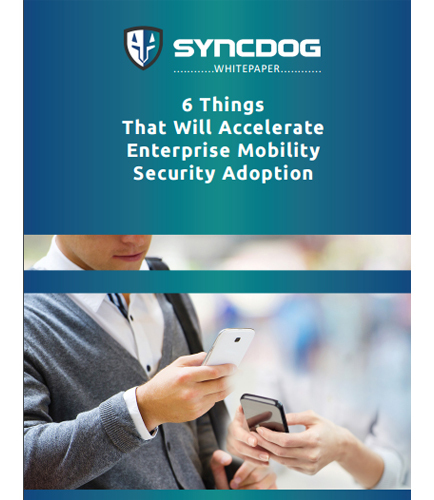 Download this informative whitepaper to get an insight on the things that will spur this industry on to better tools and best practices that will accelerate the Enterprise Mobility Security Adoption and how IT organizations can use them for better productivity without compromising protection.